TALLAHASSEE – A Tallahassee-based tort reform advocacy group prefers a Florida Supreme Court-endorsed increase in county court civil jurisdiction thresholds over a state House bill that would raise them to $50,000 over two years, the group's president said in a recent interview. 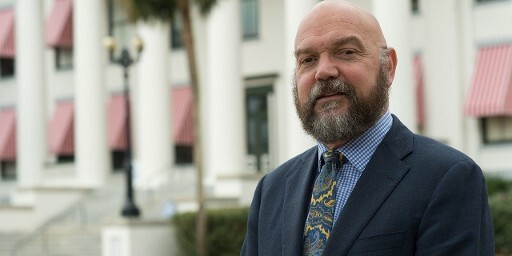 However, Florida Justice Reform Institute (FJRI) isn't so sure a threshold increase is needed, FJRI President William Large told the Florida Record. "While FJRI does not believe changing the threshold is necessarily warranted, we would support the Florida Supreme Court's recommendation of a $25,000 jurisdictional limit and then studying the impact," he said. A much larger increase proposed in a bill currently in a state House committee could cause caseload problems for Florida's county courts, Large said. "Appeals on issues up to $50,000 that currently go to the district courts of appeal would now instead be decided in the circuit courts," he said. "Our circuit courts may not be able to handle the results." And things may not be much better for the circuit courts, Large said. "Circuit court judges don't have the resources, like law clerks, to help them with this larger, more complicated workload," he said. In January, the Florida Supreme Court endorsed a reportthat recommended the civil jurisdiction threshold in the state's county courts be increased to $25,000. The current county court civil jurisdiction threshold is $15,000. The Supreme Court also endorsed raising small claims court jurisdiction from $5,000 to $8,000. Currently, any lawsuit demanding more than $15,000 must be heard in the state's circuit courts, jurisdictions that typically include several counties. Under House Bill 337, those limits would increase first to $30,000 and then to $50,000, with the resulting workload of hearing lawsuits handed over to the Florida county courts. If Florida's Republican Gov. Rn DeSantis ultimately signs HB337, the new law would take full effect by July 2021. In the first part of its text and in its description, HB337 authorizes "certain Supreme Court justices" to locate an office in their residential district to be their official headquarters that can serve as private chambers. The bill also provides for a subsistence allowance and travel reimbursement, in addition to relieving counties of any requirement to provide space for Supreme Court justices in their county courthouses. Page 5, in the bill's third section, brings up the revisions in the county courts' jurisdiction limits. The bill also contains provisions that would allow defendants to challenge how much in damages a plaintiff may seek and would allow plaintiffs to offer evidence sooner in the litigation. Florida state Rep. Tom Leek (R-Ormond Beach) introduced HB337 into the House on Jan. 17 and later that same month it was referred to the Civil Justice Subcommittee, which gave it a favorable vote on March 20 before reporting it out the following day. Later in March the bill was referred to the Justice Appropriations Subcommittee, which reported it out April 2. The bill now is in the House Judiciary Committee. Leek did not respond to Florida Record requests for comment but he is reported to have told The Florida Bar in March that he was working on issues in HB337 that he expected would be addressed in committee. HB 337's state Senate counterpart, Senate Bill 328, allows for jurisdictional limits in the state's circuit courts to be $50,000 by Jan. 1, 2022. SB328 is sponsored by Sen. Jeffrey P. "Jeff" Brandes (R-St. Petersburg) and currently is in the Senate Judiciary Committee, which has taken no action on the bill since early March. HB337 isn't what Florida's business community is looking for, Large said. "The business community wants the consistency and transparency of the current appellate process," he said. "This bill would increasingly lead to 20 circuits worth of appeals to reconcile, rather than five district courts of appeal." HB337, if it becomes law, isn't likely to save taxpayers money in any way, Large said. "Not that we can tell," he said.